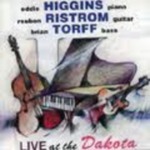 "Live at the Dakota Café (CD)" by Eddie Higgins, Reuben Ristrom et al. Brian Torff is responsible for one composition (The Heather and Jan.
Brian Torff is the bassist and is responsible for one composition (The Heather and Jan) on this CD. Contents: Opening Applause -- Billie's Bounce -- It might as well be spring -- The peacocks -- There is no greater love -- O barquinho (little boat) -- The lamp is low (Pavane for a dead princess - Ravel) -- The Heather and Jan -- Jitterbug Waltz -- Love theme from "The Invasion of the Body Snatchers" -- Here's that rainy day -- This can't be love. Higgins, Eddie; Ristrom, Reuben; and Torff, Brian Q., "Live at the Dakota Café (CD)" (2000). Visual & Performing Arts Faculty Music Gallery. 18.